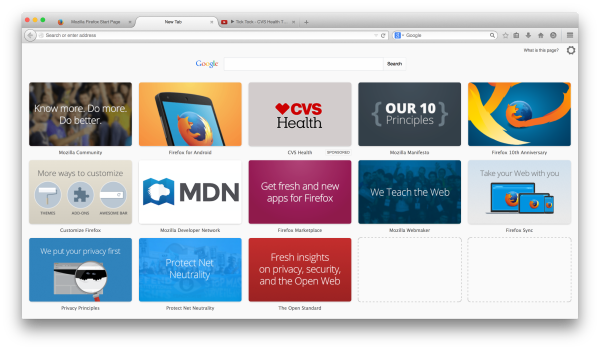 It is the day that many thought would never come – Firefox will begin monetizing their browser by displaying ads on their homepage and in the tiles when a user opens a new browser tab. Mozilla had initially announced the possibility of changing from their previous ad-free stance, but there was plenty of concern over privacy issues and how the ad content would be determined and then delivered to the end user. But they have been testing new enhanced tiles, which display ads, with a small group of users over the past year. For new users and those who delete their browsing history will see ads within the tiles displaying on Mozilla’s homepage and new tab screen. Otherwise, tiles will be based on anonymized browsing history not other targeting methods. When we collaborate, we need to understand the vision and objectives of the partner, and to understand if that partner is able to work within the framework of Mozilla’s principles. Running sponsored content in Tiles is results-based, not surveillance-based. We do not allow tracking beacons or code in Tiles. We are not collecting, or providing them with, the data about you that most digital ad networks do. There are certain categories that require screening or what’s commonly known as age-gating, or have other sensitivities, that we will stay away from, such as alcohol and pharmaceuticals. They have announced two initial partners for the , CVS Health and Booking.com including CVS. One interesting aspect to this is that many users of Firefox are running some sort of ad blocking software, and it doesn’t seem that Firefox plans to prevent ad blocking for working, or preventing those creating ad block extensions to whitelist Mozilla’s own ads. In fact, according to AdExchanger, this isn’t an issue for Mozilla at all. Mozilla themselves have stated they expect AdBlock Plus, the most popular ad blocking extension, will begin blocking tiles in a future update. The new advertising enhanced tiles will go live in multiple countries: Argentina, Australia, Austria, Belarus, Belgium, Brazil, Canada, Chile, Colombia, Ecuador, France, Germany, Hong Kong, Japan, Kazakhstan, Mexico, New Zealand, Peru, Russia, Saudi Arabia, Spain, Switzerland, United Kingdom, United States and Venezuela.